With an individual company enjoying dominance, the facial injectables market in North America exhibits a monopolistic vendor landscape. In 2016, Allergan Plc., held the dominant share of 62% in the North America facial injectables market and is expected to remain the leading company through the forecast period. Its dominance is attributable to the strong brand value of its drugs such as Juvederm and Botox. Of these, Botox currently witnesses the highest demand and the trend is unlikely to change until 2024, finds Transparency Market Research (TMR) in a new study. According to TMR, the North America market for facial injectables is likely to showcase a CAGR of 12.0% between 2016 and 2024. At this pace, the market will reach US$5.8 bn by 2024, as compared to its value of US2.1 bn in 2015. By geography, the U.S. and Canada is at the fore of the North America facial injectables market. Among these nations, the U.S. held dominance as it exhibits a considerably high demands for botulinum toxins and dermal fillers. High living standards and demand for enhancing facial features through minimally invasive methods have catapulted the U.S. to the fore of the North America facial injectables market. Based on product, hyaluronic acid, collagen, botulinum toxin, and polymer fillers constitute the key market segments. Of these, botulinum toxin held the largest share in the North America facial injectables market. It is predominantly used to correct lines, wrinkles, and creases. The botulinum toxin segment is forecast to exhibit a CAGR of 12.7% between 2016 and 2024. Synthetic products are nowadays developed using polymers and particles, which has considerably upped the demand for facial injectables in North America. These novel products are liked more by consumers as they boast a longer shelf-life, which helps consumers push the need for re-treatment farther. Furthermore, the rising availability of facial injectables, which offer permanent effects, is also enabling growth in the North America facial injectables market. Also as innovations are brought to reduce frequency of the treatment, the cost incurred on facial injectables is reduced, making the procedure more affordable, thus fuelling their demand. 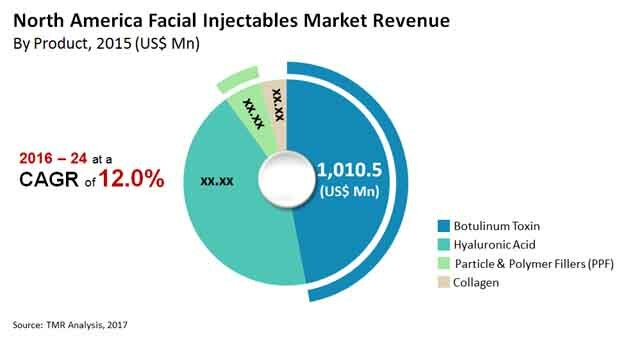 The facial injectables market is raking high profit in North America also against the backdrop of the paradigm shift toward minimally invasive surgeries. The market will therefore gain as minimally invasive surgeries gain prominence in dermatological applications. Changing lifestyle choices, rising disposable income, and alternating standard of beauty and attractiveness will therefore emerge as key growth drivers. On the downside, using facial injectables exposes a person to potential allergic reaction, as the procedure often involves the use of living organisms and related enzymes and chemicals, which can hamper the market’s trajectory to an extent. Furthermore, side-effects such as bruising, bleeding, and edema are also expected limit the scope for the market’s expansion. Poor reimbursement policies for procedures involving facial injectables also stall the market’s growth.